Christmas Press is a small children’s publisher, a partnership business between four creators: myself; illustrator and designer David Allan; author and illustrator Fiona McDonald; and writer and editor Beattie Alvarez. We started in 2013 and to date(March 2015) have published 4 books – three picture books featuring retellings of traditional tales – fairy tales, folk tales, myths and legends by well-known authors(to date, Ursula Dubosarsky, Kate Forsyth, and myself, with more to come this year) and lavishly illustrated by emerging illustrators – in this case, David and Fiona (though more illustrators will come on board next year). We have also published a Christmas anthology, Once Upon A Christmas, with poems, stories and illustrations by lots of different authors and illustrators. Christmas Press itself will continue to concentrate on those sorts of books but we have just started a new fiction imprint for young people, Eagle Books, which will concentrate specifically on adventure fiction. And very excitingly our launch title is the first new English translation in over a hundred years of the great Jules Verne classic, Mikhail Strogoff, which will be translated by Stephanie Smee, whose previous translations of the great classics by the Countess de Segur have been bestsellers. 2. What made you interested in setting up a small press? We felt there was a gap in the market–and that there WAS a market for retellings of traditional stories, the kinds of books we weren’t seeing around but that we’d all grown up on, loved, and been inspired by. And then as Christmas Press developed, we felt there was also an opening for the kinds of very adventure-focussed fiction that Eagle Books will focus on. Exciting news about our new fiction imprint, Eagle Books! Eagle Books, the brand-new fiction imprint of Christmas Press, are thrilled to announce that our launch title will be the first English translation in over a hundred years of one of the best adventure novels of all time, written by one of the most popular writers of all time: Jules Verne’s Mikhail Strogoff. First published in French in 1876 as Michel Strogoff, it is a rip-roaring tale of adventure and suspense, painted with romance and humour and set in pre-revolutionary Russia. Suitable for both adult and young readers from 11 and up, it is a book that’s inspired countless film and TV adaptations all over the world. In France, it’s been a huge success from the word go, and has never been out of print, with most people considering it to be Verne’s best novel. But it has dropped out of sight in English-speaking countries as the original English translation–published well over a century ago!–is rather stodgy and dated for modern tastes. But in Stephanie Smee’s perfectly-pitched, lively translation of the original 1876 French text, the first such translation in over a hundred years, English-speaking readers can discover for themselves just why this novel has such an enormous following not only in France but all over the world. Stephanie is a Sydney-based translator who turned in a legal career to combine her true loves of literature and French. She is responsible for introducing the enormously successful works of much-loved French author, the Countess de Ségur, to a whole new generation of English-speaking children, and those translations have been bestsellers. To celebrate this major publishing event, we have just today launched a crowdfunding campaign to fund production of a beautiful collectible limited edition, not available on the general commercial market(commercial hardcover and paperback editions will follow later). This exclusive collectible edition will be limited to 750 hand-numbered copies, with internal pages of soft cream paper, and each chapter featuring a delicate black and white illustration by artist David Allan. The cover will feature a full colour illustration by David Allan, set into high-quality textured red hardback binding, and the book will feature other special elements, such as coloured end-papers, a satin bookmark, and gold foil detail on front, spine and on book block edges. This beautiful book will be available to Australian and New Zealand contributors for a pledge of AUD $55, postage included, and to all other international supporters for AUD $75, postage included. There are also many other levels of support, from $10 to $1000, and some truly fantastic perks for contributors, from commemorative bookmarks to playing cards, limited edition prints of the illustrations, authentic 19th century prints featuring Russian scenes, hand-painted book plates, and more. The campaign will run till May 16, 2015. We invite you to join us in bringing back this fantastic novel to English-speaking readers! Cover reveal of Two Fearsome Fairy Tales from France! 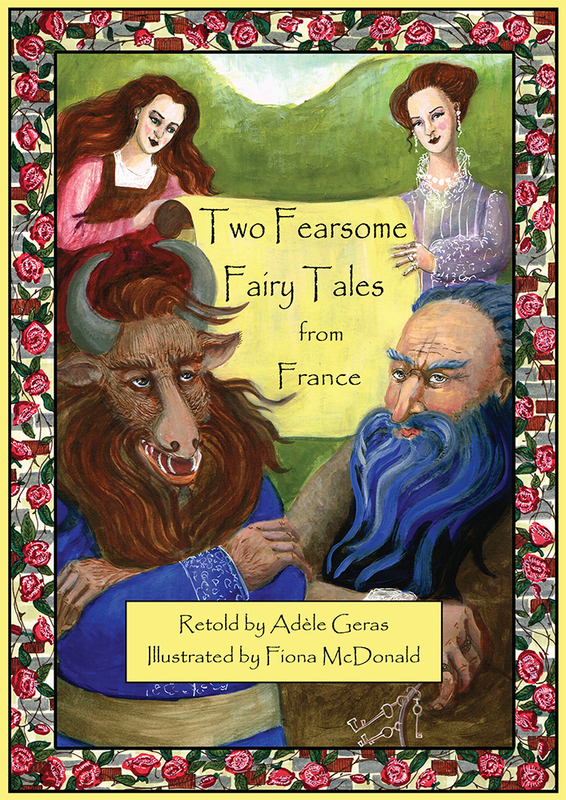 We’re excited to reveal the beautiful cover of our forthcoming title, Two Fearsome Fairy Tales from France, elegantly retold by Adele Geras and lavishly illustrated by Fiona McDonald. The book, which features classic scary, magical French tales, Beauty and the Beast and Bluebeard, will be out in shops in late April. It’s the first of our books to be published in hardcover, and it looks absolutely fabulous! More soon.